RealView Graphics in SolidWorks (View drop-down -> Display -> RealView Graphics) makes your models look visually impressive on the screen. You get to see the materials and floor reflections in real-time, without having to render the model in PhotoView. 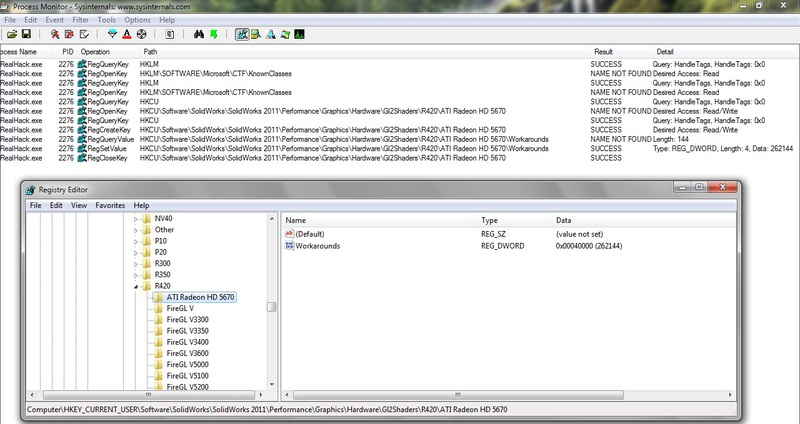 There are certified graphics cards recommended by SolidWorks (ATI FireGL and nVidia Quadro ranges) which have this RealView functionality, however they can be expensive (as they are specifically for CAD Applications, as opposed to Gaming). In saying that, you can get a cheap RealView certified graphics card for ~€125. A while back, I got a Medion MD8855 computer in Aldi, which had an ATI Radeon™ HD 5670 graphics card with 1024 MB memory. 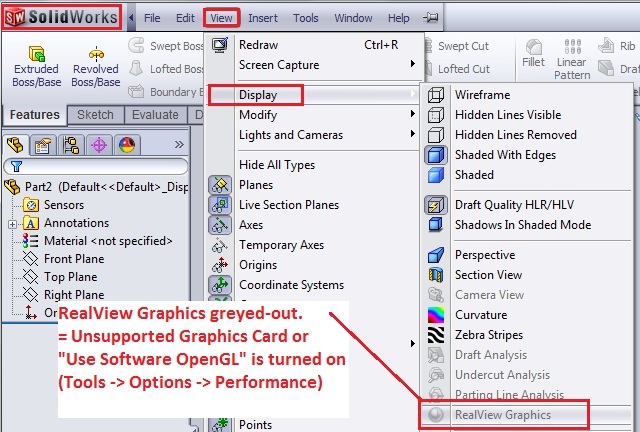 As expected after installing and opening SolidWorks, the RealView graphics icon (View -> Display -> RealView) was greyed out. Also, under Tools -> System Options -> Performance, “Use Software OpenGL” was unticked, as it should be, unless you have an onboard or very poor graphics card. If you google, there are two main methods. One is using RivaTuner to adjust your graphics card/drivers, saying your graphics card is actually a ATI FireGL or nVidia Quadro. Another is to modify SolidWorks with a RealHack exe program (which edits the registry settings for SolidWorks). The RealHack program worked perfectly for me with SolidWorks 2011 SP5 x64 on x64 Windows. Run the exe and click ATI or NVIDIA. Open SolidWorks. Check for the RealView icon. Using process monitor, you can see what realhack does. It appears to (only) add entries to the registry. 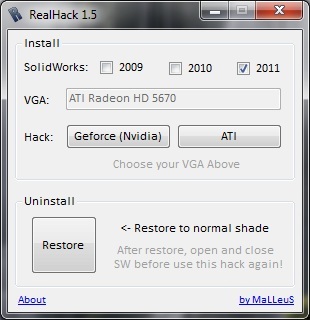 There is also a RealHack 2.0 available which supposedly works for SolidWorks 2012 (which has Ambient Occlusion). Again, you can find this with google (local copy). Presumably this app enters different registry entries depending on what your current graphics card is. Of course SW may change things in the future and this app may not work. 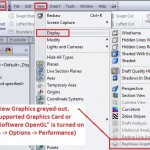 It is surprising however as to why SolidWorks doesn’t allow RealView to work on more graphics (gaming or other) cards. Error: The database file ‘C:\SolidWorks Data\lang\english\swbrowser.mdb’ is not the expected version. 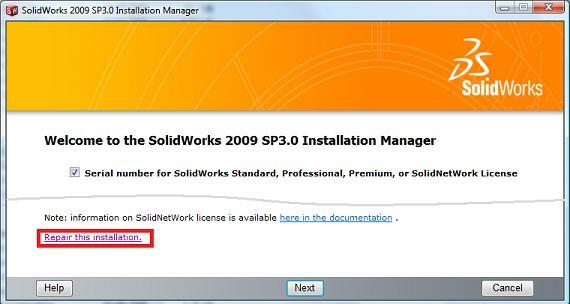 Typically you would see this error if you have recently upgraded your SolidWorks install to SW2010 or SW2011. SolidWork should have updated your HoleWizard/Toolbox database, or maybe it installed a new one, and the wrong path is listed in Tools -> Options -> Hole Wizard / Toolbox. 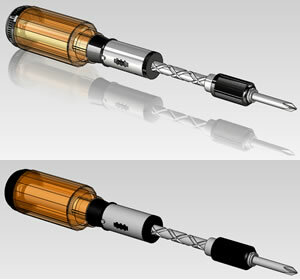 Open SolidWorks, Tools -> Options -> Hole Wizard / Toolbox. Check that the path is correct and if different paths were found above, try browsing to them. 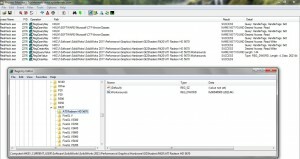 If you have another computer running the same latest version of SolidWorks, copy their C:\SolidWorks Data to your computer. Browse to: “C:\Program Files\SolidWorks Corp\SolidWorks\Toolbox\data utilities” and run UpdateBrowserData.exe Browse to the swbrowser.mdb file inside C:\SolidWorks Data\lang\english and click “Update”. That should do the trick. I was recently trying to install SolidWorks 2011 on Windows 7 x64 and it failed. Typically I’d expect problems with XP x64, but not with Windows 7 with .Net and Windows Installer all part of the OS. 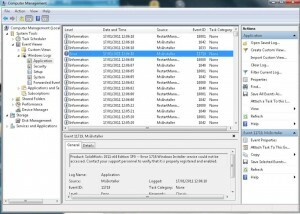 The SolidWorks Installation Manager provided a link to the Installation Logs ( C:\Users\username\AppData\Roaming\SolidWorks\Installation Logs\2011 SP0 ). 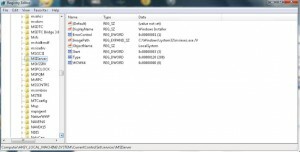 Looking at the latest txt file ( SummaryIMLog_20110.txt ) I saw “Installation Error 1719” and “Installation Error 1603”. I also looked at the Windows Event Viewer, and saw the failed installation and the Error 1719. See image below. As Windows Installer v5 is part of Windows 7, it would not show up in Add/Remove Programs to do a repair (as I would have done for XP). As on the SW KB, I had tried registering and reregistering Windows Installer. I even browsed directly to the SolidWorks setup (bypassing the Installation Manager), but it immediately threw up the 1719 error and stopped. If you have done a clean re-install of SolidWorks and are still getting strange errors (such as missing dlls, or “unknown file types”), it may well be Microsoft .NET Framework at fault. Most of the time, looking in the Windows Event Viewer will confirm this if there are .NET Framework errors showing up. The first step is to do a repair of .NET Framework, by going to Add/Remove Programs, right-clicking on .NET Framework (choose 3.5 or 3.1 if present) and going Repair. This should work, however sometimes it doesn’t. 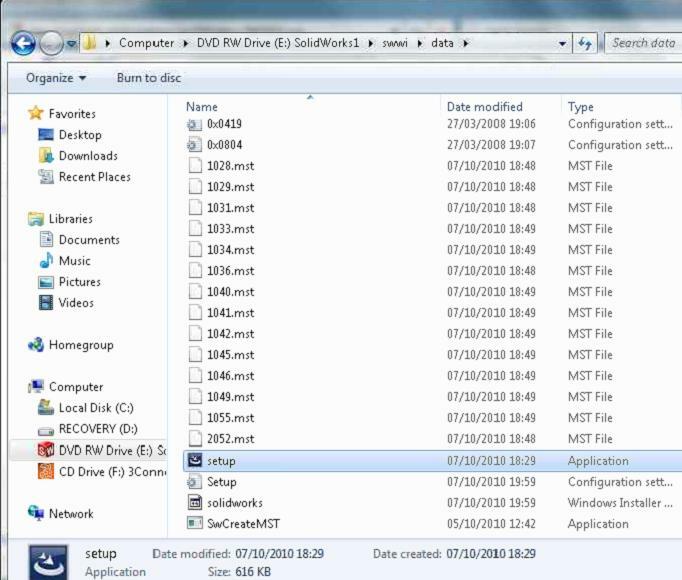 Exploring the SolidWorks DVD and in the prereqs folder run “dotnetfx3.exe” (or dotnetfx3_x64.exe). I tried this however I got strange errors about “mscoree.dll” etc. Just run the exe file and go “Cleanup Now”. 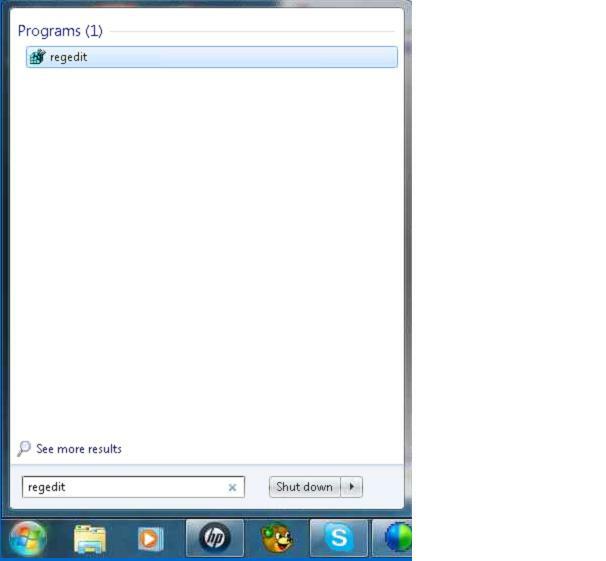 After the reboot, look in Add/Remove Programs. If its Windows XP, you will see the original .NET Framework 1.1 listed. Thats perfect. From the prereqs folder of the SolidWorks DVD run “dotnetfx3.exe” or “dotnetfx3_x64.exe”. Fingers crossed the dll errors or strangeness in SolidWorks will have gone. Search the SolidWorks Knowledge Base for the dll error messages or for errors regarding the feature you are having issues with (such as property tab builder etc.) It will typically tell you if its a .NET issue. 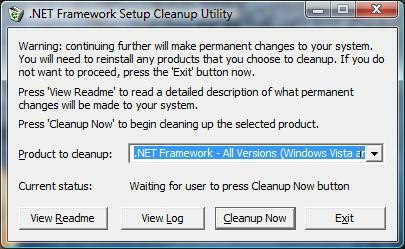 After running the cleanup tool, rebooting, installing dotnetfx3.exe SolidWorks will work fine. Installing .NET Framework 3 (the dotnetfx3.exe linked above and on the SW prereqs folder), will install .NET Framework 2.0 and 3.0. I suggest you run Windows Updates, several times. More than likely a .NET 3.5 will have to be installed. Note also, until you run Windows Updates and install all .NET Frameworks that were in place (in Add/Remove Programs in the very begining), some other installed programs on your computer may give out. Especially useful for macros which loop through lots of operations. Note: SW may have to be restarted to allow a macro to run afterwards. Well after getting my hands on SW2010, I got straight into installing it and looking through the Whats New PDF. The install went fine, albeit I had to end Windows Explorer and WinSCP processes (hopefully this means that the install will be rock solid). For those people who may not be familar with the procedure, I put up some screenshots. In the case of the third image, you may need to go to the View -> Select Columns -> PID to see the appropriate column. Remember, this is only a beta release! 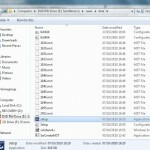 I also did change the install directory to Program Files/SolidWorks Corp 2010/. The install finished fine. No need to restart the PC as I ended Windows Explorer (and left explorer.exe closed for the duration of the install). I started SW2010 up, activated it and that was it. Easy. That’s it for the moment. Lots and lots more to come. 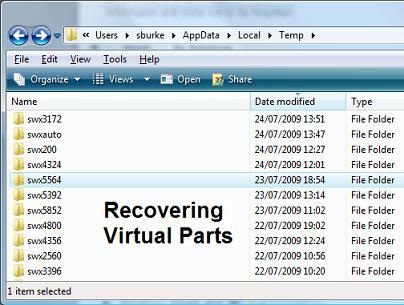 This article outlines how I saved myself an hour of work by been able to recover virtual parts after SolidWorks crashed. While I was working on an old assembly project, I took some parts, and went “form new subassembly”. It prompted me for a template and off I went opening up the New sub-assembly. I saved regularly. Little did I realise that I was working on a Virtual sub-assembly. After spending 60+minutes working on the sub-assembly, saving it religiously (thinking I had it saved externally). I went back to the main assembly and was fixing a few mate errors when, solidworks froze. I was a little impatient, thinking I had my sub-assembly and 60+ minutes work saved! After re-opening the assembly I saw no sign of my work, and was about to pack it in for the day. After sorting by Date Modified, the parts were in a folder called “swx5792”. I copied the part out of there and to safety. Phfew. Thanks SolidWorks. As virtual parts become more and more mainstream, I hope this tip will help somebody and save them some time. This article outlines the methods I use to debug SolidWorks whenever it starts behaving badly, i.e. crashing or hanging on a consistent basis. Of course you need to be able to replicate the crash / hang in order to track down the problem. I will attempt to place these methods in order of how I would proceed when diagnoising an issue. This article, part 1 focuses on SolidWorks crashes / hangs when running or opening the program (as opposed to install problems which will be covered in a later article). Why might crashes or hangs occur? There are a number of reasons SolidWorks might start crashing or hanging. What is very important is “when” did SW start behaving like this. It is extremely important to narrow down the cause and timing of the crash as much as possible. There is nothing more difficult to analyse than “my computer is slow today” or “solidworks is crashing all the time”. While you replicate the crash, write down the scenario, what files you have open, what method are you doing. Try replicating the issue on different files. If a person can say “When I do XYZ, ABC happens” then is makes things a lot easier. Open SolidWorks -> Tools -> Add-Ins and untick everything. START -> run -> regedit -> Browse to HKEY_CURRENT_USER\Software\SolidWorks. Rename SolidWorks to SolidWorksOld and start SolidWorks. More specifically, the Add-Ins which are marked as for start-up are located in: HKEY_CURRENT_USER\Software\SolidWorks\Startup\Applications\ I always find that it is much safer to rename folders rather than deleting them. Being a 3D CAD package, SolidWorks makes extremely heavy use of the graphics card. If you get “blue screens”, computer shutdowns / reboots, then you need to try enabling Software OpenGL. Even better, however takes a little longer, is to check and upgrade your graphics card drivers. 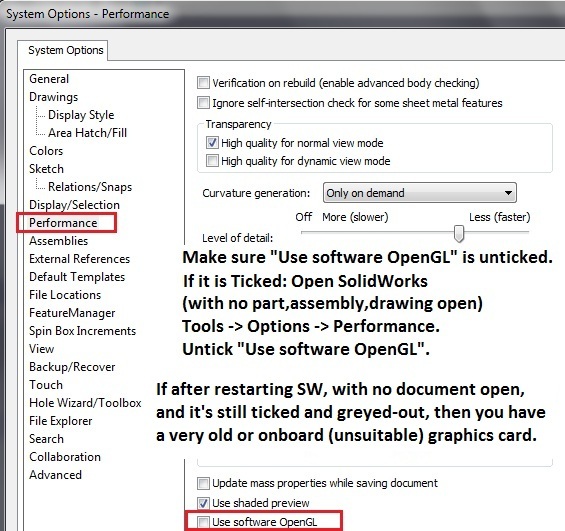 Open SolidWorks -> Make sure there are NO open Parts/Assemblies or Drawings -> Tools -> Options -> Performance -> Use Software OpenGL. A lot of people store everything on the Network, and as such work directly off the network. Thus if SolidWorks hangs for a while, a quick test is to plug out the network cable. Note: this is not an ideal method. Its better to disable the Local Area Connection Adapter. But if SolidWorks starts responding immediately after been disconnected from the Network, things are looking up. 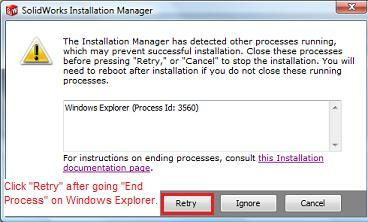 See the step below for “Process Explorer”. If you have a SNL network license, it should be ok, as SW has a network timeout period. If its a PDM issue, then your going to have to do connectivity tests (separate debugging required). It is essential for you to search the SolidWorks Knowledge Base for keywords describing what you are doing to cause the crash. It may be a Vista specific issue. It may be a 3rd party software issue. It is vital at this stage that you consult the KB to see if there have been similar issues. You will also need to know what version of SW you are using, and what Service Pack version you have installed -> Open SolidWorks -> Help (drop-down) -> About SolidWorks. START -> run -> regedit -> Browse to HKEY_CURRENT_USER\Software\SolidWorks. Rename SolidWorks to SolidWorksOld and start SolidWorks. Then create a few parts and drawings and restart SolidWorks. While it might take 30-60 minutes to upgrade to the latest service pack, it is advised. It could save a lot of further work. On the first screen of the SolidWorks Installation Manager, choose “Repair”. Note: This is not available on SolidWorks Installs done using an Administrative Install Image. 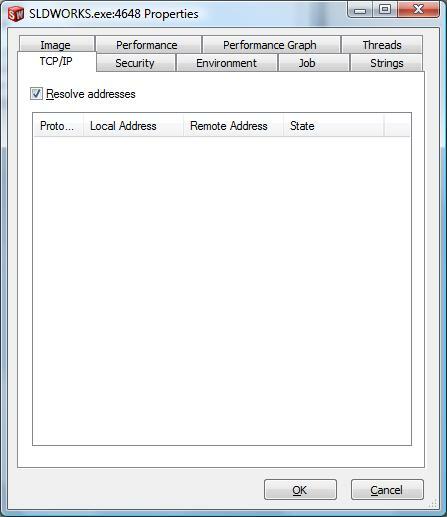 This simple tool, which can be downloaded here (local mirror), requires no installation, and has solved a number of problems for me. 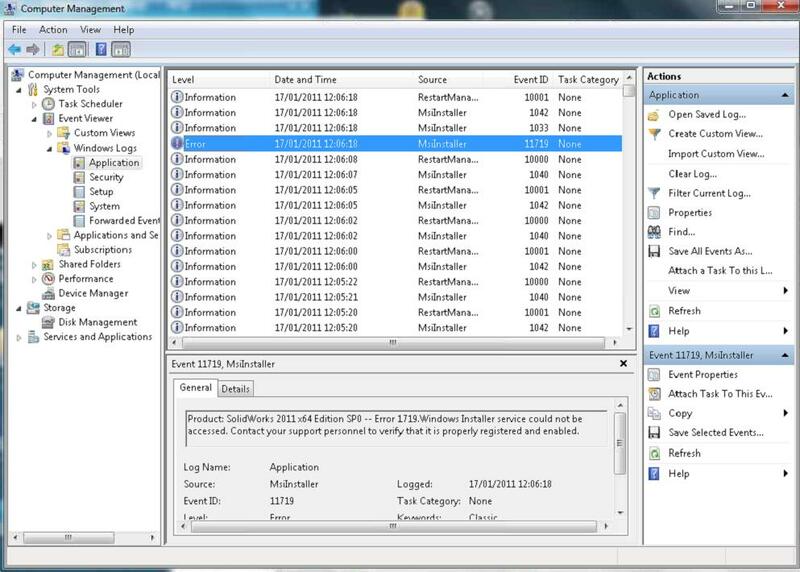 Process Explorer can show what files SolidWorks opens on startup and throughout, all network activity associated with SW, processes called by SW and a host of other features. SLDWORKS.exe will show up in the top screen. Once it opens, double-left click on SLDWORKS to bring up a properties dialog, from here you can choose TCP/IP. 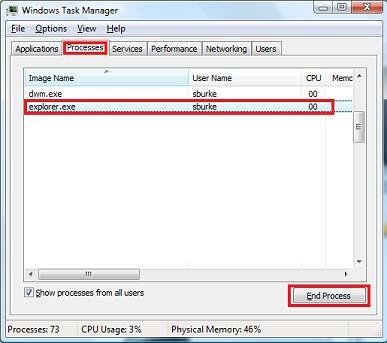 Process Monitor is better that the above Process Explorer. 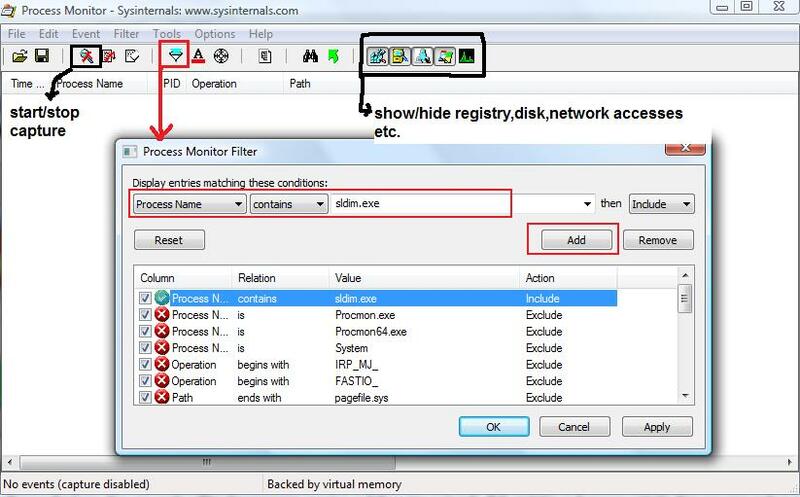 You can apply a filter for processes running and then view network, disk, registry and process activity. You can save and open Events for later analysis. Download from Microsoft. 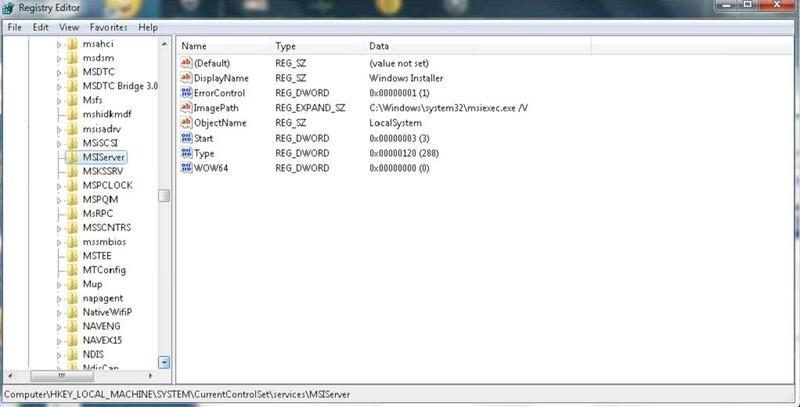 Use the Process Name “sldworks.exe” to monitor SolidWorks. 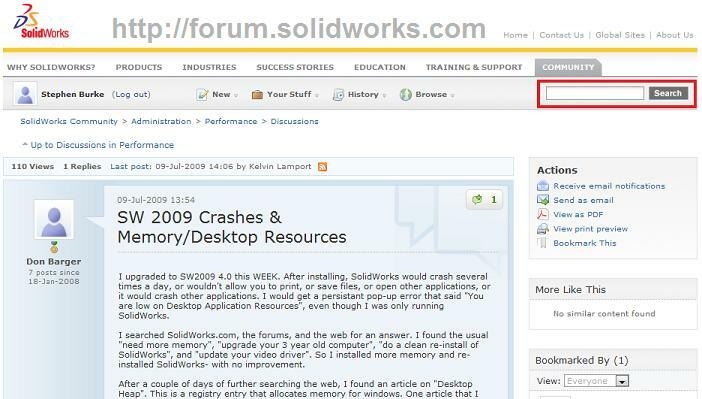 Typically I look at the SolidWorks User forms at http://forum.solidworks.comaround now. Having said this, the search facility in the new forums has improved and should speed up things. Note: Make sure you login to be able to search!! As you will see in the image below, there are other users out there who have gone through similar problems. I remember finding out about an issue with logitec drivers and freezes in the graphics area. 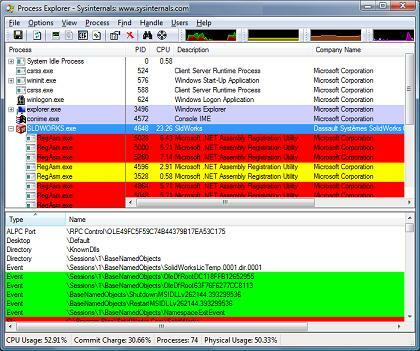 Googling a particular issue or dll or file which may be suspect from the Process Explorer may yeild some results. In the resulting Zip file given by the Problem Capture, take a look at the following files: swxJRNL.swj (a macro of a SW session) and SolidWorksPerformance.log (shows idle time, total running time etc.). There could be an entire post on RX (maybe will post one later if people are interested). As the SolidWorks software is typically newer than Windows (XP is many years old at this stage), several Windows updates and pre-requesites are required for SolidWorks to install and function correctly. For whatever reason, (AntiVirus etc.) certain dlls or pre-requesites may not get installed during the install or upgrade of SolidWorks. Whats more frustrating is that no immediate error might appear. Instead an error or “strange behaviour” may occur when using SolidWorks. 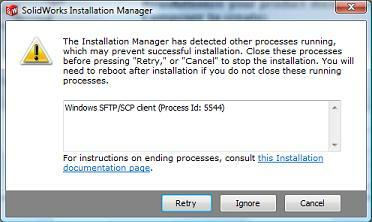 Windows Pre-Requesites must be installed manually when using an Administrative Image install method! Check if the install is created using an Administrative Image ( Add / Remove Programs -> Change/Modify SolidWorks. When SLDIM starts, if the only option is to Remove, its an Admin install image ). I’ve had quite a few headaches caused by incorrectly deployed Admin Images. Of course all these details are in the “SolidWorks Installation and Administration Guide” which we all read, don’t we? ( SolidWorks 2009 Installation and Administration Guide ) On the previous page, go to: Multiple Installations -> Installation -> Deploying Installations to Clients -> Command Line Deployment -> Preparing Clients for Administrative Images. 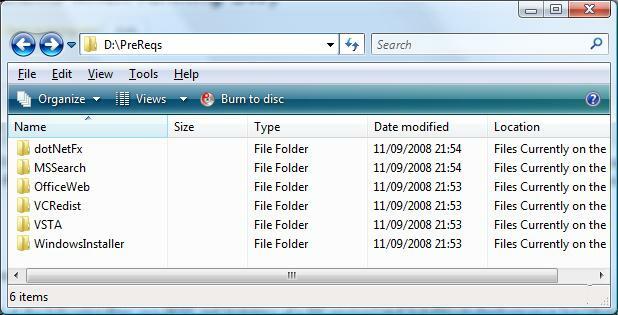 If you “browse” your SolidWorks DVD you will find a “PreReqs” folder. Take a look at S-034736 on the SolidWorks Knowledge Base for further information. XP is more likely to require these updates, opposed to Vista. START -> RUN -> regedit and remove all traces of SolidWorks under HKEY_CurrentUser and HKEY_LocalMachine. Of course the methods and procedures to debug SolidWorks are endless. Above are some of the ones I use. I do recommend that Windows does be wiped and installed a fresh. Everyone I have talked to agrees that reinstalling windows breaths new life into a computer. A combination of Windows updates, redundant software, excess software and plugins cause a pool of potential problems. Also, make sure to contact your local SolidWorks VAR and let them know of your issues. They will know the most common issues for particular service packs and versions and will be immediately poised to help you quickly resolve any issue. While using an Excel based BOM (as opposed to a standard BOM) is not as flexible as a standard Bill of Materials, there are various customisations which can be done. E.g. 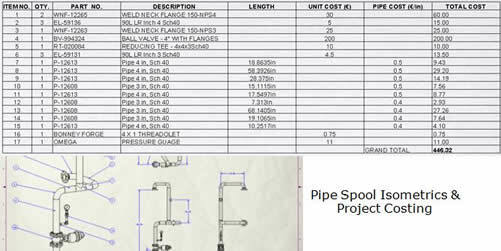 if you want a complete project costing (taking into account price per meter length of piping or weldments). Note: in recent versions of SolidWorks (2008,2009 etc.) it is possible to do totals and equations in standard BOMs, however they require some post manual tweaking. This post shows how a custom Excel based Bill of Materials for a SolidWorks Assembly drawing can be created. Open bomtemp-all.xls Look at the various Headings in Row 1. Remove/Add Columns to suit making sure to type in the SolidWorks File Property name into the “Name Property” box (see image below). This shows up the list of Name Properties in the Excel file. Be extremely careful! Once the Excel file is saved, go to SolidWorks, pre-select the view (typically the Isometric view) and then go: Insert -> Tables -> Excel Based Bill of Materials. Choose your template file, and voila. Note: The name you entered in the “Name Property” box in Excel must correspond with the Property in the PART. Go to the Part, File -> Properties -> Custom and make sure the Property name is present. If you formatted the Headings in your Excel template, and wish for these to come through, make sure to have “Use the document note font when creating the table” unchecked when initially Inserting the Excel Based BOM. In a recent Piping SolidWorks Project, I wanted a complete costing done on my BOM. I created several columns, including “Unit Cost”, “Pipe Cost”, “Total Unit Cost” and “Total Pipe Cost”. In the once-off parts I created a unitcost SW Property in the parts. For the piping (same with weldments), I opened the source pipe file (used in routing), and added a costpipe property (which had a cost per meter). An image of the completed table can be seen below. This Excel template file can be downloaded from here. (There are 2 columns containing calculations which are hidden. This level of detail would not have been possible in a standard Bill of Materials). This level of customisation available within SolidWorks is just the tip of the iceberg! So I came across an issue with Excel BOM’s which caught me. It is not possible to have properties such as SW-Title, SW-Author, SW-Filename, or any property with a hyphen ( – ) in its name in an Excel based Bill of Materials. This limitation is caused by Microsoft Excel. In the Name Property box for each cell, it is not possible to have a hyphen ( – ). The workaround given by SolidWorks (S-015804) (On the Knowledge Base at http://customerportal.solidworks.com ) is to create a Custom Property (as normal in SolidWorks). E.g. to have SW-Title appear in a BOM, you need to create a Custom Property called SWTitle and link it to: $PRP:”SW-Title”. Then when creating the Excel BOM template, insert the Name Property SWTitle. Of course if you have a project already created, and only realised this at the end, its a little more difficult. SolidWorks Task Scheduler may be able to add this Custom Property to all of your files. Hopefully this will help someone, and me too in case I forget!